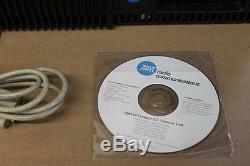 TAIT TB8100 VHF Repeater 136-174 Mhz 50 Watts w Programming HAM. 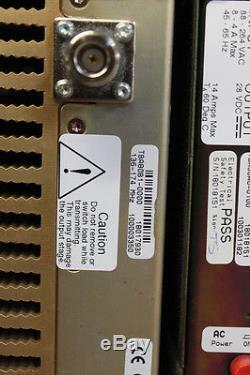 TAIT VHF Repeater, model number TB8100. 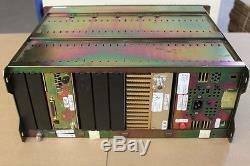 This is a 50 watt repeater that operates in the 136-174 for Transmit and 140-174 for Receive Unit comes complete and guaranteed fully operational. 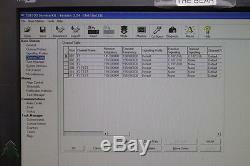 Included in this sale is the programming software and cable. The unit was programmed and tested at RX 141.000 and TX 138.000 RX sensitivity was. 23 and TX was 51 watts. 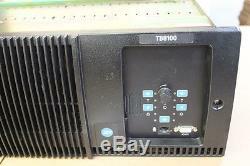 Tait TB 8100 VHF50 Watt - FEATURES. With advanced and intuitive features, 8000 Series products lead their class. The TB8100 is Tait's highly flexible analog base station, ideal for any application from a simple, conventional repeater to advanced simulcast or trunked systems. With its modular design, robust RF performance and customised programming, the TB8100 will conform to your individual system design requirements. The Advanced Profiles option gives you precise control over your channel configuration and access to the most advanced configuration options available on any base station. With the Power Save option, the TB8100 is ideal for solar sites or sites requiring low current draw. The TB81 00 receive power can be as low as 60mA, meaning the power consumption of the base station is dramatically reduced. The TB8100 has continuous duty cycle operation at full performance specifications, within the complete temperature and altitude range. Designed to withstand extreme temperatures, this base station has been specified to operate continuously at full power, at up to 15,000 feet (4572m) and as high as 140°F (+60°C) in temperature. This makes it ideal for use in busy trunked systems. With outstanding specifications for selectivity, adjacent channel interference and fast key-up times, the TB8100 system provides exceptional RF performance. You can depend on the TB8100 in the busiest of RF environments. Monitor an entire network from a central location with the TB8100 base station and the Alarm Reporting option. T need to manually connect to each base station to check it, minimizing maintenance time and costs. The TB8100 continuously checks 43 different alarm parameters. At the first sign of trouble, the base station dials up an Alarm Center and provides it with a list of recent alarms and other status information. With a fast key-up time of 2ms the TB8100 is ideal for data applications. A Computer Controlled Interface (CCI) allows communication between computer equipment and the base station. The TB8100 also has a Task Manager - a programmable logic controller that handles alarms, digital inputs and outputs, internal flags, counters and timers. This enables you to easily write your own applications. With its many remote monitoring options the TB8100 is ideal for isolated sites. The self-monitoring application has dial-out capability so you are immediately notified of potential issues. More than 150 parameters can be managed remotely with the TB8100 Service Kit software. Several system interface options are available, including Isolated Audio, Isolated Audio E&M, TaitNet RS232, TaitNet MPT 1327 Trunked and Ethernet. An optional Ethernet systems interface enables IP management of your communications system. This enhances the remote monitoring and diagnostics capabilities of the TB8100, and reduces your site and maintenance costs. This is available with TaitNet MPT, TaitNet QS2 and conventional systems. The TB8100 Paging Applications Board provides a paging interface and makes it possible for the base station to be used in POCSAG paging applications. 750mW with Power Save, 7.2W standard. The TB8100 is also available in a multi-reciter format. Up to seven reciters can be fitted in a rack (or up to five plus a power management unit) - ideal for voting, multi-channel TaitNet QS2 Simulcast and other systems requiring independent monitoring and recording. Competitively Priced DC Only Option. 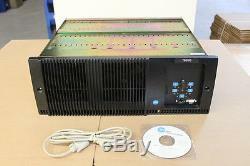 With a 12V DC PA only system the TB8100 is capable of a lower power consumption? 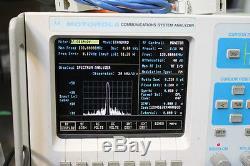 Approximately 750mW at 5s receiver cycling. TB81 00 equipment is designed to be easily transitioned from analog to P25 digital operation. An optional kit makes the transition to the TB91 00 series straightforward. The modular design of the TB81 00 makes for easy maintenance, expansion and upgrade of the base station. Front-loading modules slip into the 4U subrack, making building the system, replacing a module or accessing a system interface board fast and simple. 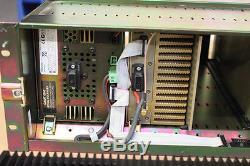 Reciter: contains the receiver and the exciter. 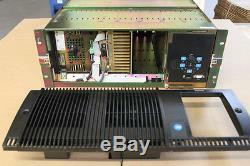 Power Amplifier: available as 5W, 50W and 100W modules. 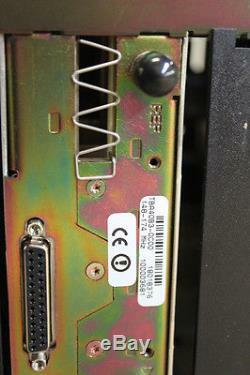 Power Management Unit: more than just a power. 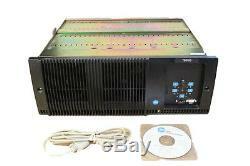 Provides AC and/or DC power, includes a standby power supply and an auxiliary DC power supply. We will only program up to 16 channels and do not program for trunking systems. The item "TAIT TB8100 VHF Repeater 136-174 Mhz 50 Watts w Programming HAM" is in sale since Thursday, July 27, 2017. This item is in the category "Business & Industrial\Facility Maintenance & Safety\Surveillance & Alarm Equipment\Two-Way Radios". The seller is "erac1" and is located in Lakewood, Colorado. This item can be shipped to United States, Canada.